You don’t need Jimmy McMillan to tell you that housing in New York is expensive. But figuring out why the rent is so damn high, and what to do about it, is a knotty policy question. Thanks to new research from NYU’s Furman Center for Real Estate and Urban Policy, one underlying reason for the high cost of New York City housing is crystal clear: The mandatory parking minimums in the city’s zoning law, first established more than half a century ago. The evidence is more solid than ever that the city’s parking minimums are a major factor making New York City less affordable. The report, “Minimum Parking Requirements and Housing Affordability in New York City,” shows for the first time the extent to which parking minimums actually affect New York City developers. Data compiled by authors Simon McDonnell, Josiah Madar and Vicki Been indicates that in many cases, they only build as much parking as they are required to by law. Before this research, said McDonnell, “No one had any idea at a broad scale whether developers were building at the minimum.” Without the minimums, developers would probably build less parking. Looking at every large, market-rate and entirely residential building completed in Queens between 2000 and 2008, the authors compared how much parking was required by zoning to how much was actually constructed. Of the 38 buildings that met those criteria, 18 of them had exactly the amount of parking required by the minimum. Another four actually had less than required, perhaps because they received a variance. Only five buildings built more than four more spaces than required. “That would suggest the minimum is quite binding,” McDonnell concluded. Academics have long understood how city-mandated parking can increase the cost of housing. If developers can turn a profit on parking, they’ll build it themselves. Any additional parking built because of a mandate is a money-loser (at least compared to the additional housing that might be built in its place), the cost of which must be borne by tenants and buyers. Housing advocates, too, have argued that requiring more parking drives up housing costs. Apologists for parking minimums could always contend, however, that developers would build that much parking anyway, in order to meet demand. The new report confirms that the minimums are in fact distorting what gets built. In a majority of the cases studied, parking requirements are binding developers and therefore increasing the price of housing. McDonnell, Madar and Been don’t estimate exactly how much parking minimums increase housing costs, but they do offer some guideposts. Above-ground structured parking, they say, costs more than $21,000 per space in New York City, not including the cost of land. Below-ground parking is even more expensive. Even surface parking carries enormous costs given the price of land in New York. In the very least expensive residentially zoned areas in the city, they estimate, just the land required to build a five car parking lot would cost more than $100,000. And that’s only direct costs. By taking up valuable space and making it harder to build, parking minimums also restrict the supply of housing, driving up costs across New York City. If the oversupply of parking leads to increased car-ownership and increased driving, as all but one study in their lit review shows (that one, tellingly, is from the New York City Department of City Planning), then all the safety, environmental and congestion costs of increased auto use should also be included. Future research, said McDonnell, will broaden the inquiry to smaller projects, other boroughs, and commercial uses. Based on the author’s literature review, the case for making housing more affordable by cutting parking minimums is already incredibly strong. A 2003 report by the New York chapter of the American Institute of Architects [PDF], for example, noted that many of its members had to cancel projects because parking requirements made them uneconomical. Moreover, they wrote, “Parking requirements often limit the size of a building footprint more than floor area ratio,” the piece of the zoning code intended to limit density. “The largest and most difficult zoning constraint affecting the development of new housing has been the requirement of building on-site parking spaces,” stated a report commissioned by New York City to lay out a comprehensive program for reducing housing costs [PDF]. That 1999 report, updated in 2005, found that even where parking minimums had been cut, as for affordable housing projects, they were still making development expensive or impossible. 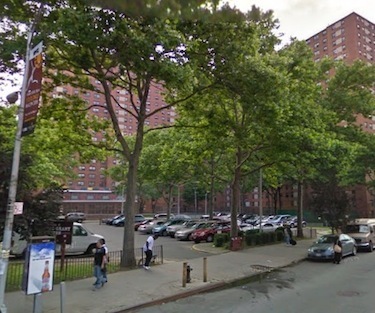 The report noted that NYCHA had recently abandoned attempts to build out some of its sites because the agency couldn’t meet the parking requirements. they should NOT be incentivized to own cars! But residents of public housing need parking! Just like they need jacuzzis and stained-glass windows. Again, I think the assumption that the parking minimums cannot be gotten around is incorrect in most cases. Just look at any building constructed by or for the Orthodox in Brooklyn. A ride up and down Bedford and Franklin Avenues between Atlantic and Myrtle should be instructive. NYCHA is perhaps constrained because part of the game is dividing up the zoning lot so the development lot is small enough to waive, and I guess that is a game they won’t or can’t play. The key to reducing the minimums, and perhaps imposing maximums (which I think would be required in many places), is convincing those that use on-street parking that new development would not create new competitors for a fixed and overtaxed number of spaces. And that, I believe, would require permits to park overnight on the street in certain areas, limited in number if there were a “parking shortage” in that area, and available to incumbents at a more modest fee than for newcomers. Larry Littlefield, I agree that some parking needs to be reserved for incumbents for a period of, say, 10 years. Wikipedia calls that Residential zoned parking. Typically, residents in the zone pay a small fee to the government in exchange for a placard or sticker placed on their automobile(s) that indicates the zone designation (signified by a number or letter). The Grant Houses were constructed prior to the 1961 Zoning Resolution, so I doubt there was no parking requirement there and then. We’re not there yet but like “inclusionary housing,” an idea that DCP was slow to embrace, parking minimums will be revised someday. Wow. That is some swell at-the-end-of-a-long-week syntax. Let’s bring back the old days! No parking , no toilet seats, no closet doors. Did anyone check the actual density at this site? Maybe you can’t pile more on here. Just a thought. I’ve never understood the argument that developers will build that much parking anyway. Then there’s no need for the minimum, is there? Either it’s superfluous or positively harmful (as these results suggest), so let’s get rid of it already. This should be one issue where you can get agreement between those who want developers to stop encouraging driving and those who want the government to stop dictating rules to property owners. In that case these “apologists” should have no problem with abolishing this requirement. What an absurd statute. City officials have as much admitted that parking minimums exist as a way to assuage local opposition to upzoning. The reason parking wasn’t in PlaNYC I is because the administration ultimately decided that upzoning was the highest priority, and that destructive parking policies were an acceptable price to pay for winning it. In both Flushing and Staten Island, City Planning was forced to raise minimums as part of new housing deals. It remains the conventional wisdom among the political class in most of the city that more parking equals less traffic. Those numbers don’t add up to 38? Will Philadelphia Go Backward on Parking Requirements and Housing Affordability? In many American cities, free on-street parking remains more abundant than affordable housing. Despite the housing crunch spreading to more urban areas, the politics of parking threatens to keep it that way. Later today, NYU’s Furman Center, the Institute for Transportation & Development Policy, and Transportation Alternatives host “The High Cost of Off-Street Parking,” a panel discussion on off-street parking policy. In most of New York City, new development is required to include a minimum number of parking spaces, each of which costs tens of thousands of dollars to build. These parking requirements increase traffic, drive up the cost of construction, and make housing less affordable.